Founded in March 2009 Brain Tumour Buddies is a national charity committed to providing information and support to anyone affected by a high grade brain tumour in the UK. Our website provides in-depth, accurate and up-to -date information on all aspects of dealing with a brain tumour and has been compiled from a wide range of sources. If you can't find the information you are looking for please contact us and we will do our best to help. We also offer support to patients, carers, relatives and friends in a variety of ways including in our forum, via email and on our Facebook and Twitter pages. BT Buddies is able to continue providing information and support thanks to kind donations and generous fundraisers. Funds raised for BT Buddies also go towards funding research into high grade brain tumours. If you, or someone you know, is interested in fundraising for BT Buddies you can contact us at fundraising@btbuddies.org.uk or call 0845 459 4101. 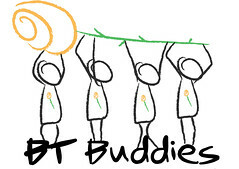 We will also be launching a new section on the BT Buddies website in the next couple of weeks which will include information on how you can raise funds for BT Buddies, resources to help with your fundraising and suggestions for events you can take part in. Watch this space! Low-grade gliomas (LGG): In an article in JAMA which is freely available here and is accompanied by a supportive editorial, Dr Asgeir S Jakola from Norway reports on a comparison of the results for LGG patients at two Norwegian hospitals where one group was given early tumour resection and the other group a biopsy and watchful waiting. The first group had better overall survival. Repeat resections: In a study of 578 GBM patients Johns Hopkins University researchers in the USA found that those who had repeated resections had longer survival than those who had just a one-time operation but the authors caution there may have been intrinsic bias because of patient selection. Brain Metastases: A French study has indicated that the combination of lapatinib (Tykerb) and capecitabine (Xeloda) is active as first-line treatment of brain metastases from HER2-positive breast Cancer. SNO Podcast: In a new initiative the Society for Neuro Oncology will arrange a SNO Highlights video podcast on the final day of its annual conference, Sunday, November 18 at 7 a.m. (Eastern US time). The link to the podcast is here. Denis Strangman and Kathy Oliver, co-directors of the IBTA, will have a display table at the SNO meeting and invite attendees to introduce themselves. Those who have not yet received a copy of the IBTA's 140-page Brain Tumour magazine (2012 edition) can collect a free copy from the IBTA table. Old drugs, new tricks: In a study that confirms the usefulness of revisiting previously licensed drugs, Mayo Clinic researchers have found that an oral rinse of the antidepressant doxepin significantly eased pain associated with oral mucositis in patients receiving radiation therapy for cancers of the head and neck. Meanwhile, a UK laboratory study of GBM cells has found that a drug used for many years in alcohol addiction treatment (disulfiram) and which crosses the blood brain barrier, might be relevant as a therapy for GBM. The UK research was funded by The Brain Tumour Charity. Embryonal tumors: Researchers at St Jude's (USA) studied 220 survivors of pediatric embryonal tumors and, based on parent-reported outcomes, largely found positive social adjustment several years after diagnosis and treatment but less so for those with Posterior fossa syndrome. 3D Neurosurgery: An electrical engineer who underwent four operations for a brain tumour nineteen years ago has invented a 3D endoscope which was used for the first time in Canada last month to remove a brain tumour. More than a dozen hospitals already use the device in the USA where it was approved by the FDA about 18 months ago. Meanwhile, the US National Institutes of Health (NIH) has given a USD $2m grant to researchers at the University of Maryland to continue with their development of a "Minimally Invasive Neurosurgical Intracranial Robot" which may assist in the removal of difficult-to-reach brain tumors. Normal brain cells into stem cells: Scientists using mice have discovered that GBMs grow by turning normal brain cells into stem cells. They found that "gliomas can originate from differentiated cells in the Central Nervous System (CNS), including cortical neurons." Fake Brain Stem Glioma: A 39 year old American woman who faked a brain stem glioma and raised USD $16,812 from unsuspecting donors has been sentenced to three years in prison. Unfortunately, there have been several cases of this nature, perhaps prompted by awareness of a greater community understanding of the lethality of brain tumours. Court action over delayed diagnosis: A 27 year old Irish man has been awarded an initial payment of Euros â‚¬2.5m (about USD $3.2m) over an alleged delay in diagnosing his germ cell brain tumour which left him severely disabled, and because of a decision by the doctors to proceed with surgery rather than Chemotherapy or Radiotherapy. Cell phones and brain tumours: There was publicity during October about an Italian Supreme Court decision that cell phones cause brain tumours. In a commentary on the decision the Atlantic magazine claimed "the decision was based on the case of a man who made work-related calls on his cell phone for six hours a day for twelve years" and who developed a neuroma. Neurosurgery drill missing: A Tobagonian man who waited for a week in Port of Spain (Trinidad) General Hospital for surgery to remove his brain tumour died when no Cranial drill was available. Apparently 60 patients had been waiting for brain surgery as there was no drill for three months. Rented drills kept breaking down and there were accusations of the hospital's drill not being properly cleaned. DNX-2401: DNAtrix Inc, which has been developing a targeted adenovirus-based oncolytic virus product (DNX-2401) for high grade brain tumours, which is under trial at MD Anderson, has merged with VectorLogics Inc.
ICT-107 and ICT-121: ImmunoCellular reports that results from the trial of its ICT-107 dendritic cell vaccine for GBM patients will be available in late 2013 and preclinical data for its ICT-121 trial involving recurrent GBM will be reported at the forthcoming SNO meeting. NCCN Clinical Practice Guidelines in Oncology (NCCN GuidelinesÂ®): Following a query to the NCCN about the non translation of CNS guidelines, the NCCN provided this statement: "While several NCCN GuidelinesÂ® have been translated, at this time the NCCN Guidelines for Central Nervous System (CNS) Cancers have not been translated. NCCN hopes to have the NCCN Guidelines for CNS Cancers translated in the future. NCCN invites potential sponsors to assist in the translation of the NCCN Guidelines for CNS Cancers by reaching out to NCCN." Pituitary tumors: Cancer.Net, which is produced by ASCO, has updated its on-line material for pituitary tumors which is available here. Videos: There have been some interesting brain tumour-related television commercials and videos that we have been made aware of recently. This is a TV commercial from the Netherlands (courtesy of STOPhersentumoren.nl) for the 2012 International Brain Tumour Awareness Week. These are two thirty-second community service advertisements from Australia (courtesy of Brain Tumour Alliance Australia) and are available here and here. This is a link to the French "Enfants sans cancer" run/walk in September organized by the group â€œImagine for Margo (Children without Cancer)â€ which raised funds for paediatric brain tumour research. International Brain Tumour Awareness Week: The Awareness Week this year was a great success with 160 brain tumour and cancer-related groups agreeing to be (non-financial) supporting organisations for the â€œWeekâ€ and the World Walk. Among other activities, there were/will be runs/walks in Italy, France, Canada, Ireland, Hong Kong, the Netherlands, the USA, the UK and Australia; Federal Parliamentarians in Australia wore grey ribbons on their jackets; and in Dublin, the new national organisation Brain Tumour Ireland was launched during a visit by IBTA co-director Kathy Oliver who also addressed the audience. The Brain Tumour Foundation of India held an Annual Day on 3 November in Mumbai attended by 250 families. An educational event held as an Awareness Week activity in Bucaramanga (Colombia) on 2 November is available on-line (in Spanish) here. The 2013 Awareness Week will be held during Sunday 27 October - Saturday 2 November. The International Brain Tumour Alliance is a not-for-profit, limited liability company registered in England and Wales, registered number 6031485. Registered office: Roxburghe House, 273-287 Regent Street, London W1B 2AD, United Kingdom. All correspondence should be sent to the Co-Directors address above, not to the registered office. Proton Beam Therapy: Controversy has erupted in the UK over the relative merits of two expensive Proton Beam Therapy (PBT) machines that the Government has ordered at a cost of Â£250m (about $402m USD) for installation in 2015 and the relative merits of less expensive Elekta and Cyberknife machines. Currently, some UK children with Inoperable brain tumours travel to the USA or Switzerland for PBT treatment. In one case a family raised Â£300,000 (about $482,000 USD) to twice send their 5 year old daughter for treatment in the USA but her tumour regrew and she is now in Palliative Care. Rindopepimut: The Celldex ACT IV study for patients with newly diagnosed EGFRvIII expressing glioblastoma is now active in 147 centres around the world, with a target of 200 centres. Centres are currently screening, or propose to screen, patients in the USA, Canada, Australia, New Zealand, Mexico, Argentina, Brazil, Colombia, India, Czech Republic, Peru, Taiwan and Thailand. The Celldex ReACT study for patients with recurrent EGFRvIII expressing glioblastoma is active in 22 centers in the USA. This trial is recruiting both avastin naÃ¯ve and Avastin refractory patients. Synthetic cannabinoid: Dr Santosh Kesari in the USA is involved with a Phase I trial of multiple doses of dexanabinol (ETS2101) which is a cannabinoid derivative that causes no psychotropic effects. It is being tested on patients with either a primary or metastatic Brain Tumour. Cancer caregivers: In a paper presented at the recent ESMO conference researchers reported on a number of statistically significant impairments experienced by people who cared for cancer patients compared with non-caregivers. Dr Isabelle Gilloteau from BMS told the IBTA E-News that the analysis did not deal with brain tumour caregivers specifically. It is an area worthy of further study, particularly if it can be shown that a new therapy which results in a better Quality of life for a brain tumour patient also consequentially results in less impairments suffered by their caregivers. Some of the more forward-looking Health Technology Appraisal Agencies (HTAs) might be prepared to take that factor into consideration in their assessments. SurVaxM: This is an injectable vaccine which is the subject of a small Phase I trial in the USA involving patients with a GBM or anaplastic Glioma. The vaccine kills tumour cells that express Survivin, which is a protein. Neurosurgery simulation: In a method reminiscent of the principles of a flight simulator, Canadian neurosurgeons and other researchers have developed a system called NeuroTouch that uses 3-D graphics and â€œhaptic tool manipulatorsâ€ (which provide tactile feedback) to train neurosurgeons in brain operations, including the removal of a brain tumour. Prototypes have been set up in seven teaching hospitals in Canada and other simulators have been deployed worldwide. Pratt and Whitney Study: A study of former Pratt and Whitney workers, which was commenced in 2002 and which seeks to investigate if toxins in the workplace might have caused brain tumours, will not be reported until later this year or in early 2013. The relevant news report is available on subscription here. Immunotherapeutic traps: Researchers at the Barrow Neurological Institute and Arizona State University in the USA have reported that the Immune System reacts differently in different brain tissues and different regions of the brain, including tumours. This finding may have implications for clinical trials involving immunotherapies. Appointment: Dr Maryam Fouladi has been awarded the Marjory Johnson Chair in Translational Brain Tumor Research by Cincinnati Childrens' Hospital Medical Center. Dr Fouladi wrote an article about the international DIPG registry for the current issue of the IBTA's Brain Tumour magazine which appears on pages 122-123. French â€“ USA collaboration: Officials from a French biotechnology company SISENE plan to work with researchers in Georgia (USA) on the development of a protein called NOV c-ter, which will hopefully inhibit another protein andrenomedullin, that is associated with the growth of new blood vessels in glioblastoma tumours. Fingerprinting of tumours: UK researchers have shown that infrared and Raman spectroscopy, coupled with statistical analysis, can be used to tell the difference between normal brain tissue and the tumour types that may arise in this tissue. See also here for the relevant journal article. Diagnosis: Patient advocacy groups in the United Kingdom have long been concerned about late and misdiagnosis of brain tumours, particularly in children. This led to the HeadSmart program featured on pages 56-57 in the current IBTA Brain Tumour magazine. New research by the UK National Cancer Intelligence Network of the diagnosis of 739,667 tumours in English patients between 2006-2008 reveals that 58% of CNS tumours were diagnosed in an emergency presentation. This percentage compared with 38% of lung cancers diagnosed in emergency presentations but pancreatic cancer diagnosis was also high at 47%. The average for all cancers was 23%. A recent Canadian study has also found unacceptable delays in diagnosis and treatment of adolescent and young adult brain tumour patients. The English finding for CNS tumours tends to reinforce the appropriateness of brain tumour-specific educational training among emergency staff in hospitals. Meningiomas: Meningiomas have not received as much clinical investigation as, say, glioblastoma, and therefore the Principal Investigator for the RTOG 0539 trial (a Phase II trial of observation for low-risk meningiomas and of Radiotherapy for intermediate and high-risk meningiomas) was pleased to report in the final newsletter for this trial that accrual had now been completed. Meanwhile, Dr James Fahner (founder of the Cancer and Hematology program at Helen DeVos Childrenâ€™s Hospital in the USA) has talked publicly of his diagnosis with a meningioma and his new experience as a patient, describing himself as â€œthe worldâ€™s worst patientâ€. ClinicalTrials.gov enhancements: The designers of the ClinicalTrials.gov website are obviously conscious of the fact that their resource is used by patients and the public searching for relevant clinical trials and not just by clinicians and researchers. The â€œAbout Clinical Studiesâ€ section now contains several enhanced features, including a glossary of common words used on the website. Morphine for paediatric patients: New dosage recommendations for morphine for paediatric patients have been issued by the World Health Organisation which are described as "a more cautious approach". They have been noted in the October issue of the WHO Access and Control Newsletter in which an article has been published as an Annex. Patient input to drug development and evaluation: In what could prove to be a significant opportunity for patient input into drug development the FDA has scheduled two public meetings to discuss process questions for patient-focussed drug development. The first meeting will be held on 25 October and will discuss a suggested list of 20 disease areas for focus in a forthcoming series of 20 public meetings. The cancer subjects listed are melanoma, lung cancer, cancer and young patients, cancer treatment in pregnancy, cancer and sexual dysfunction, and cancer and depression. Readers in the USA might care to consider if it would be useful to encourage the FDA to include brain tumours within this list. Patient stakeholders will be invited to another series of meetings, on as yet unspecified dates, to discuss patient-focussed drug development more generally. Cancer and movies: In a study of 82 movies that centre on a person with cancer, presented to the recent ESMO meeting in Vienna, Italian researchers found that there was often a disconnection between the scenario portrayed in the movies and what is happening in the treatment clinic. They also found that relatively rare leukaemia, lymphomas and brain tumours predominate among the movies. Death from cancer occurred in 63% of all movies. Dr Luciano De Fiore told IBTA co-director Kathy Oliver that 14 of the 82 movies they studied dealt with a patient with a brain tumour. ESMO play: Satire is a difficult art form. In Vienna recently officials of the European Society of Medical Oncology (ESMO) arranged for a short play to be performed during its conference which contained a grotesque parody of three types of patient: one who, as if in a trance, continuously murmured New-Age type chants throughout the consultation (the patient with a complementary and alternative medicine approach); one patient (presumably the aggressive type) who was accompanied by a medico-legal lawyer who bullishly insisted on taping the consultation; and one patient who repeatedly harangued the doctor with her scientific knowledge. All three were diagnosed with cancer. The doctor (a research professor at a well-known, but thinly veiled, London cancer hospital) had contravened bureaucratic EU research rules (the play is set in the year 2084) and, in a scene reminiscent of George Orwellâ€™s â€œ1984â€, had been sent to Room 101 for his miscreant activity. His punishment in Room 101? To have to see the three patients which, judging by the uproarious laughter and hearty applause from the several hundred health professionals in the audience, struck a chord. It was a severe embarrassment to the patient advocates who were present and not something that one would expect to find at similar conferences elsewhere. Deadline: The early registration deadline for the SNO annual scientific meeting and education day in Washington DC in November is 15 October. A new Â£15 million fund could provide nearly 8,000 more Cancer patients with access to an advanced Radiotherapy technique that results in fewer side effects. The Cancer Radiotherapy Innovation Fund, unveiled by Prime Minister David Cameron and Health Secretary Jeremy Hunt, will cover the remainder of 2012-13. The investment will be used to roll out the use of Intensity Modulated Radiotherapy (IMRT) across the NHS, so that more cancer patients can benefit from the technique. IMRT works by targeting a tumour with more precise doses of radiation, while minimising the damage done to surrounding healthy tissue. The therapy will particularly aid patients with head and neck cancers - lowering the possibility of side effects like damaged salivary glands, which can interfere with the enjoyment and digestion of food. New figures show that at present a majority of the 50 radiotherapy treatment centres across England are not offering IMRT to all patients who would benefit from the technique. The new fund will be managed by the National Radiotherapy Implementation Group, working closely with Cancer Research UK. "We're delighted with today's announcement that the Government has found the money to speed up the roll out of more targeted radiotherapy techniques," Dr Harpal Kumar, Cancer Research UK's chief executive, said. "Today's announcement is a great step forward and excellent news for cancer patients." Dr Kumar said the additional investment would help the UK become a "world-leader" in cancer treatment, adding that the advanced radiotherapy techniques offered patients a higher chance of survival. He said it was "unacceptable" that patients in some regions were currently denied access to these types of therapy, and pointed to the fact that radiotherapy cures more cancers than drugs. Radiotherapy specialists will work alongside Cancer Research UK and professional bodies to help radiotherapy centres roll out advanced radiotherapy. The experts will provide support and training, as well as guidance on applying for funding intended to make sure that patients nationwide have access to safe radiotherapy. The Cancer Radiotherapy Innovation Fund follows in the footsteps of the Cancer Drugs Fund, which has so far assisted more than 21,000 patients. From April 2013, advanced radiotherapy techniques will be available to all patients where clinically appropriate, safe and cost-effective. The new NHS Commissioning Board system means that cancer treatments will be planned and paid for on a national basis, helping patients avoid the old-fashioned 'postcode lottery', which led to some patients missing out because of where they happened to live. The change means that in theory, all patients with brain tumours who need stereotactic radiosurgery, for example, will have precisely the same access to this treatment. Health Secretary Jeremy Hunt said: "Radiotherapy is one of the most clinically and cost-effective treatments for cancer and this funding will bring our additional investment in radiotherapy over the Spending Review period to Â£165 million." Almost a third (31 per cent) of cancers in the over 70s â€“ around 38,300 a year in England â€“ are diagnosed through emergency admission to hospital, according to new research* by the National Cancer Intelligence Network (NCIN), published today (Friday) in the British Journal of Cancer (BJC). In all ages, 24 per cent â€“ around 58,400 cases a year â€“ are diagnosed through an emergency presentation. This new study examined the journey of nearly three quarters of a million cancer patients (739, 667) between 2006 and 2008 in England and worked backwards to see how they were diagnosed with cancer and the sequence of events that took them there. In those over 70, around 70 per cent of cancers of the Central Nervous System and over half of pancreatic (55 per cent) and liver (52 per cent) cancers were first diagnosed after an emergency admission to hospital. Patients first coming to hospital as an emergency before having cancer diagnosed could have presented in a variety of ways including, coming into A&E due to their cancer symptoms, coming into A&E with, for example, a broken hip and having cancer detected, or being referred straight to A&E by their GP because their cancer symptoms are so severe. Of all ages the data shows wide variation between cancers, with a high percentage of emergencies for cancers of the brain and central nervous (62 per cent); pancreatic cancer (50 per cent) and lung cancer (39 per cent). This was compared to cancers with easier to spot symptoms such as skin and breast cancer which had just three and five per cent emergency admissions. For all cancer types, patients are much less likely to survive the next year if they are diagnosed through emergencies. Sara Hiom, director of information at Cancer Research UK and one of the study authors, said: â€œOur findings showing the sheer numbers of cancer patients first seen as an emergency are startling. Early diagnosis of cancer, when the most effective treatments are more likely to be options, helps improve a patientâ€™s chance of surviving their disease. â€œWe donâ€™t yet know the reasons that lie behind these stark figures but, although we might expect higher numbers of older patients to have cancer detected as an emergency, we urgently need to understand why there is such a great proportion. It may be that older people are reluctant to bother their doctor with possible cancer symptoms, or they could be slipping through the net as symptoms may be dismissed as â€˜the usual aches and painsâ€™ or â€˜old ageâ€™, or their GP could have referred them but their condition has progressed so rapidly that they end up as an emergency in hospital. Fasting and therapy for brain tumours: In an Open Access study appearing in PLOS One researchers have identified a beneficial role for controlled starving (fasting) in the sensitisation of rat, mouse and human cells to radiation therapy and Chemotherapy (TMZ). A corresponding author Professor Valter Longo commented that patients should consult with their oncologist before undertaking any fasting: "You want to balance the risks. You have to do it right. But if the conditions are such that you've run out of options, short-term fasting may represent an important possibility for patients." Brain Metastases: A Cochrane review of whole brain radiation therapy (WBRT) alone versus WBRT and radiosurgery for the treatment of brain metastases concluded that their "Analysis of all included patients, SRS plus WBRT, did not show a survival benefit over WBRT alone. However, performance status and local control were significantly better in the SRS plus WBRT group. Furthermore, significantly longer OS was reported in the combined treatment group for recursive partitioning analysis (RPA) Class I patients as well as patients with single metastasis." Blue asbestos and brain tumours: A study of people who were exposed to blue asbestos in childhood in Western Australia has found that both males and females have elevated numbers of brain cancers compared with the general population of that State. Improved nanoparticles: Researchers at Johns Hopkins (USA) have found a way to improve the inflitration of nanoparticles into the brain by coating nano-sized plastic beads with PEG (poly (ethylene glycol). Their next step is to slow tumour growth or recurrence in rodents. Green tea and Cognitive function: Chinese researchers have found that a key property of green tea (EGCG epigallocatechin-3 gallate) can improve cognitive function by impacting the generation of neuron cells. You can access the full article here. Depleting miR-138 and glioblastoma: Singaporean researchers in collaboration with Austrian researchers have shown that using antimiR-138 on mouse models could halt the progression of glioblastoma tumours and reduce the likelihood of a relapse. Childhood Cancer: On 31 August the US President Barack Obama proclaimed September 2012 as National Childhood Cancer Awareness Month. US Home Depot and Brain Tumour employee: A Home Depot store in Maryland has lost a $100,000 lawsuit after the store fired a longtime cashier while she was on unpaid leave to have a brain Tumor removed. AZD7451: US researchers will be initiating a Phase 1 trial of AZD7451, which is a Tropomyosin-Receptor Kinase (TRK) Inhibitor. They will be studying the effect of the drug on the invasiveness of glioblastoma in patients who have not responded to standard postoperative therapy or whose tumour has progressed. PNET and Folic Acid fortification: A study of childhood cancer incidence trends in association with the US FDA's mandated fortification of foods with folic acid has indicated a possible connection between reduced primitive neuroectodermal tumor (PNET) rates and a 1992 recommendation that women of childbearing age consume 400 micrograms of folic acid daily. See also here. Northwest Biotherapeutics: Northwest Biotherapeutics has obtained approval from the UK Medicines and Healthcare Products Regulatory Agency (MHRA) for its Phase III clinical trial of DCVax-L immune therapy to proceed in the UK. BiCNU (Carmustine) and BMS: Bristol-Myers Squibb is recalling 31,000 units of BiCNU, an injectable version of the drug carmustine, after discovering one vial was overfilled. The recall affects products sold in the US, Canada, Europe, Latin America and Asia-Pacific. Carmustine is used to treat brain tumours. Afinitor Disperz: The U.S. Food and Drug Administration has approved the Novartis therapy Afinitor Disperz (everolimus tablets for oral suspension), a new pediatric dosage form of the anti-cancer drug Afinitor (everolimus) used to treat a rare brain tumor called subependymal giant cell astrocytoma (SEGA). Afinitor Disperz is the first approved pediatric-specific dosage form developed for the treatment of a pediatric tumor. Hong Kong: A Hong Kong charity, St James Settlement, will provide subsidies of up to HK$56,000 each to 25 patients who have a glioblastoma brain tumour and cannot access Temozolomide through the Hospital Authority. Deadline: The deadline for the lowest registration rates for the Society for Neuro-Oncology Conference in Washington in November is 15 October. Crowdfunding: Crowdfunding is a way of utilising digital connections to raise funds for various projects, usually of an entrepreneurial nature. While we are unlikely to see it used to raise funds for drug discovery a group of US-based video game designers are using the method to try and cover the anticipated treatment costs for an uninsured colleague who has a glioblastoma brain tumour. Correction: It has been pointed out to us that the large (71,793 person) Patient Experience Survey, reported in the August issue of the IBTA E-News, which showed poor results for brain tumour patients, encompassed the views of patients only in the UK and not Scottish or Welsh patients. The International Brain Tumour Alliance is a not-for-profit, limited liability company registered in England and Wales, registered number 6031485. Registered office: Roxburghe House, 273-287 Regent Street, London W1B 2AD, United Kingdom. All correspondence should be sent to the Co-Director's address above, not to the registered office. This section includes all the latest BT Buddies news as well as brain tumour news stories from around the world. If you have a story you'd like us to post please contact us and we'll get it added as soon as we can! Checkout our photos on Flickr!